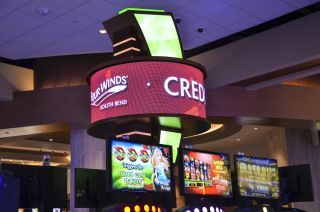 The new Four Winds Casino in South Bend, IN recently upgraded some of its internal wayfinding signage with two 360-degree NanoLumens Nixel Series LED curved displays atop slot machines on the casino floor. According to Musa Balogun, the casino’s director of gaming maintenance, the new curved displays are clearly visible from far away in most directions, making them the ideal solution to inform guests of ATM locations and assist in wayfinding. For maximum visibility, effectiveness and value, that meant using NanoLumens truly curved displays. The secret to NanoLumens’ display technology is the Nixel, the company’s patented flexible building block that comprises all NanoLumens Nixel Series displays. NanoLumens Nixels actually bends and flexes to create both convex and concave curved displays. This makes the displays 100-percent seamless and provides superior aesthetics from 360 degrees, even viewed up close, according to the company. KGM Gaming, manufacturer and supplier of products within the gaming industry, was tasked with designing, building, and installing the new display structures. After considering all digital display options, including using four LCD monitors at each site, it became clear that brightness, visibility, longevity, reliability, and eye-catching nature of a 360-degree NanoLumens true-curved LED display made the product an ideal fit for this installation. According to Jack McNamara, VP pperations for signage and millwork, KGM Gaming, the result of the installation at Four Winds South Bend is pure eye candy that draws guests’ attention and ensures they are always aware of the nearest ATM location. McNamara said they mocked up several designs, including one that would have used four traditional LCD panels at each of the four ATM locations, but they didn’t provide true 360-degree visibility and couldn’t display the same kind of enticing visual that a circular display is capable of. KGM designed architectural signs that extend nearly to the ceiling, with the curved NanoLumens displays taking center stage and providing the casino owners a dynamic, exciting way to communicate with their guests. Each 5mm pixel pitch NanoLumens display is 1.5 feet tall with a diameter of 3.5 feet, making them the most clearly visible signs on the entire floor. In addition to the attractiveness and wide visibility, NanoLumens LED displays also eliminate the need for bezels and grid lines that interrupt content and distract viewers. Because NanoLumens technology is lightweight, low power, low heat, and warrantied down to the pixel for six full years, it works well for high-traffic, always-on environments like casino floors.